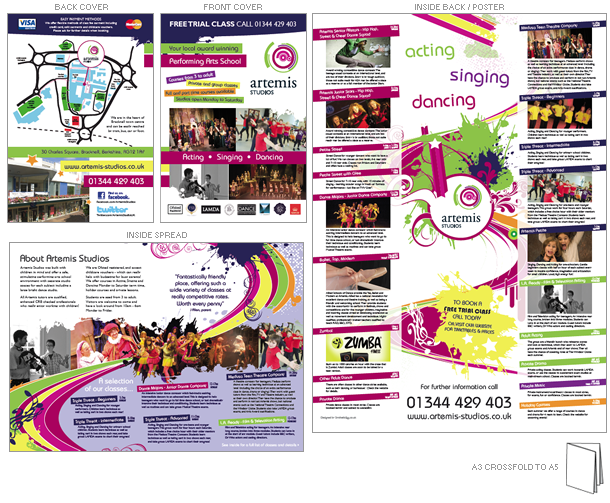 Details: Artemis Studios is an award winning performing arts school based in Bracknell, delivering a wide range of Dancing, Singing and Acting classes in a professional studio environment for all ages (3yrs to adult). They needed a new brochure to promote all their classes and the school itself, which needed to work both as something they could send out to prospects and something that they could distribute via schools and libraries etc. As such it needed to be lightweight and visually exciting. We agreed on an A3 crossfold to A5 format, which gives the equivilant of 8 A5 pages and is a convenient size for leaflet dispensers and posting out, and also allows for an internal poster space for displaying on the wall. I gave this brochure a fresh look and feel whilst keeping it on-brand, and packed in details for 19 courses. I also designed a new map to help visitors find the studios in the heart of Bracknell Town Centre.